I received word from Roger Proudfoot (Green Party Peterborough City Council Elections candidate for Werrington) that tadpoles were trapped in water-logged tyre tracks on some public land near a stream in Orton Brimbles! So I tooled up with buckets and aquarium nets, put the word out for a couple of volunteers and earlier today we made our way to the location to investigate. We did indeed find a tyre track in the mud that had filled up with rain water and was teeming with tadpoles. Why did these tadpoles need to be rescued? Orton Brimbles Tadpole Rescue from Julie Howell on Vimeo. Tadpoles may be in trouble if they have been spawned in a puddle that is likely to become low in oxygen or evaporate altogether. Although they have gills by the time they hatch, it will be several more weeks until the tadpoles can breathe air. Tadpoles cannot survive without a source of food. This is why they need to be in ponds where there is ample supply of the things they like to eat, such as green water plants. If frogs lay so much spawn why did you bother rescuing these tadpoles? VERY IMPORTANT: It is usually NOT a good idea to transfer frog spawn or tadpoles from one location to another as doing so can spread both invasive plants and harmful diseases that the spawn or tadpoles may carry with them to their new location. In other words, moving tadpoles may do more harm than good, no matter how good your intentions. Frogs lay spawn in such large quantities because only about 10% of it ever survives. This is not a problem. Frog spawn and tadpoles are an important part of the natural ecosystem and food chain that supports many other animals (including dragonflies, hedgehogs and newts). On this occasion, however, the tadpoles could not survive where they were and if left they all would have died. If you see tadpoles in ponds near where you live, please don't move them! For information about frogs, frog spawn and tadpoles please visit Frog Life. Tyre track teeming with tadpoles from Julie Howell on Vimeo. Why didn't you just scoop them up and chuck them in the stream? Great care must be taken when moving tadpoles from one body of water to another. If we had removed the tadpoles to water that was cooler or warmer than the water they were trapped in, they may have gone into shock and died. Some tadpoles can survive in fast flowing water, but their chances of staying alive are greatly reduced. Ideally, they need to be in a still pond for their best chance of survival. How did you move tadpoles from the puddle to a pond safely? Before attempting to move the tadpoles, we filled a bucket with water from the pool the tadpoles were already in. This way, when we moved the tadpoles from the pool to the bucket they were less likely to experience a potentially catastrophic change in water temperature and go into shock. Collecting the tadpoles from Julie Howell on Vimeo. Now we were ready to move the tadpoles. While we could have used a kitchen sieve(!) it is better to use nets designed for the purpose of moving small aquatic creatures. We picked these up from a local pet supplies centre for a couple of pounds. These nets are ideal as the netting is fine, so the water ran through but the tiny tadpoles remained in the netting where we could see them. We gently and slowly swished our nets through the water. We caught both tadpoles and debris. We carefully picked out any large pieces of debris from our nets. We then submerged our nets containing the tadpoles into the bucket of water. We gently swished our nets so the tadpoles could escape into the bucket. We repeated this process until all the tadpoles were safely in the bucket. The next thing to do was release the tadpoles into a nearby pond. Once again, we took steps to make sure the tadpoles would not die of shock when released into water that was cooler or warmer than the water they were already in. We used a second bucket to collect some water from the pond that would be the tadpoles' new home. We checked the temperature of the water in the two buckets and found they were about the same. 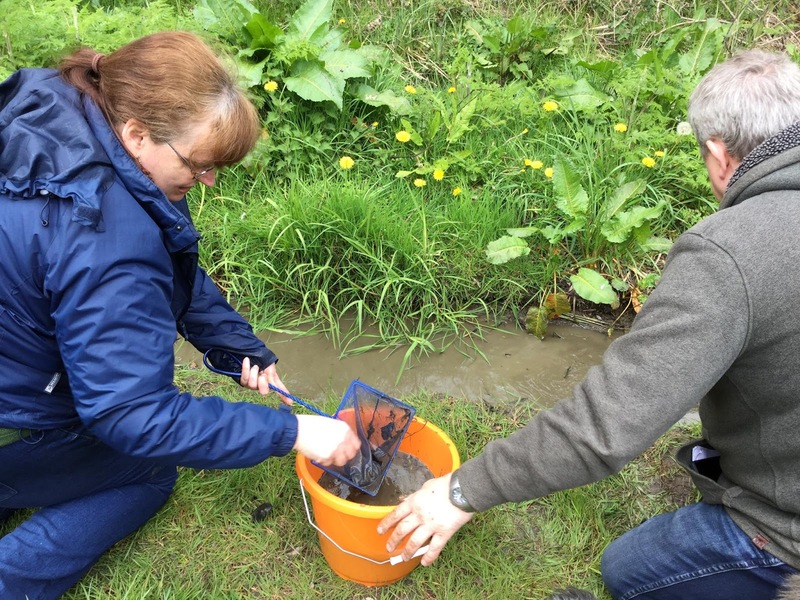 We then slowly poured some of the water from the pond into the bucket of tadpoles and left the bucket for a while so the tadpoles could get used to any change in temperature gradually. After about 20 minutes, we used our nets to gently move the tadpoles into the pond until the bucket was empty. With less than two weeks until the day of the local elections (5 May, as if anyone would forget), teams from every political party have been out in their wards, leafleting. There are just over 4,000 homes in my ward and I intend to reach them all. This is not humanly possible for me on my own, so I rely very much on the support of my fellow Peterborough Green Party members. When you stand as a party candidate there are things you find out about that you didn't know you didn't know (and didn't know that you needed to know). I won't spoil the surprise for future candidates reading this (or give too many of our team's secrets away). However, there is one essential piece of equipment that no leafleter should leave home without. 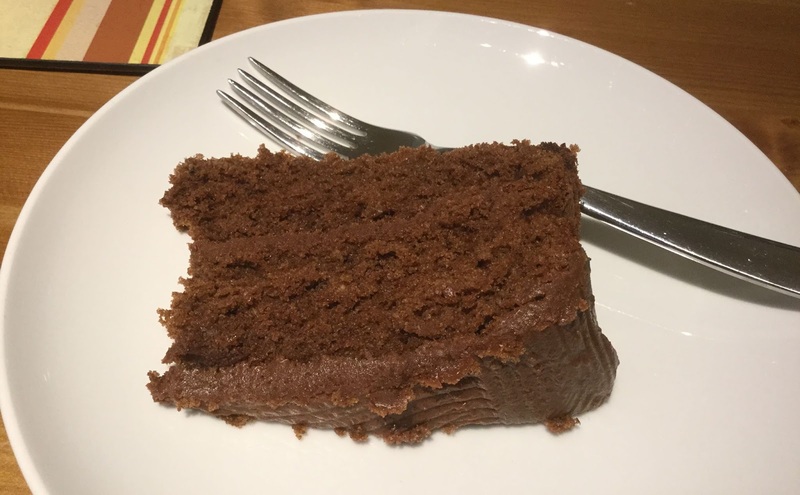 Turns out, wooden spoons are useful for far more that making chocolate cake. Who knew? Come election time, the common wooden spoon is transformed into a 'weapon of mass discussion'. What do we do with it? Wouldn't you like to know. I am extremely grateful to my Peterborough Green Party colleague Alex for teaching me how to use a wooden spoon to make my leafleting safer and more efficient. In fact, I've since become an evangelist for the 'Alexander' technique. When out leafleting, you are very likely to cross paths with people delivering leaflets for local businesses. I'm very shocked to see none of them with a wooden spoon. Several times now, I've waved my spoon at them and advised, 'you need one of these!' They smile the kind of smile that masks real fear and continue on their way. Oh well. Perhaps they don't value their fingers as much as I do. This is me standing outside St Mary's Church (St Mary the Virgin) in Church Drive in Orton Waterville. St Mary's churchyard is a beautiful, peaceful place, being permanent residence to many cherished trees, the graves of some local parishioners and a number of war memorials, including the 12ft high parish war memorial. Unfortunately, however, it is not the idyllic scene that it ought to be. Here's the same photograph again, uncropped. To the right of the picture, on the ground, is a discarded beer can. Is it because there are insufficient litter bins in Orton Waterville? No, there are plenty of public litter bins in the area. Is it an area popular with tourists who don't have the same respect for our heritage as we do? Seems unlikely. Littering happens for complex reasons. The most obvious is thoughtlessness. However, sometimes it runs deeper than this. We keep our communities tidy and clear of litter because we care about them, feel proud about them and feel that we are a part of a community that cares enough for its environment and the wellbeing of others to keep it clean. To put that another way, littering can sometimes be a visible sign that some people in a community don't feel included or valued or part of something their proud of. If you've ever been on one of our flash mob litter picks, you'll never look at litter the same way again. You will have a deeper understanding of the many ways litter hurts our environment and hurts our communities. This is one of the reasons why Peterborough Green Party organises community litter picking events. The very act of taking part in community litter picking helps everyone involved to feel a sense of ownership over the problem of litter. When you've spent an hour picking it up, you no longer feel like it's someone else's problem. "Oh, the council will deal with that." Peterborough City Council will certainly deal with some of it, but without community support it's simply impossible to keep every street clear of litter all the time. At Peterborough Green Party we want Zero Litter and we feel this is achievable. However, Zero Litter will only come about when people drop less litter, when the community plays a greater part in picking up litter AND when the City Council makes periodic sweeps of whatever is left. Zero Litter is a community effort. 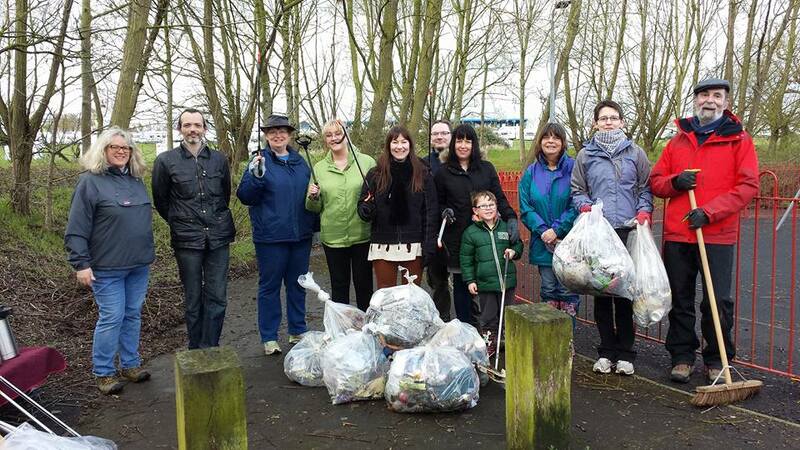 If you would like Peterborough Green Party to help organise a Flash Litter Pick in your area, let me know. Coming to your doormat soon! I'm really pleased to write for local FREE magazine Nene Living, which is delivered to houses right across our ward. 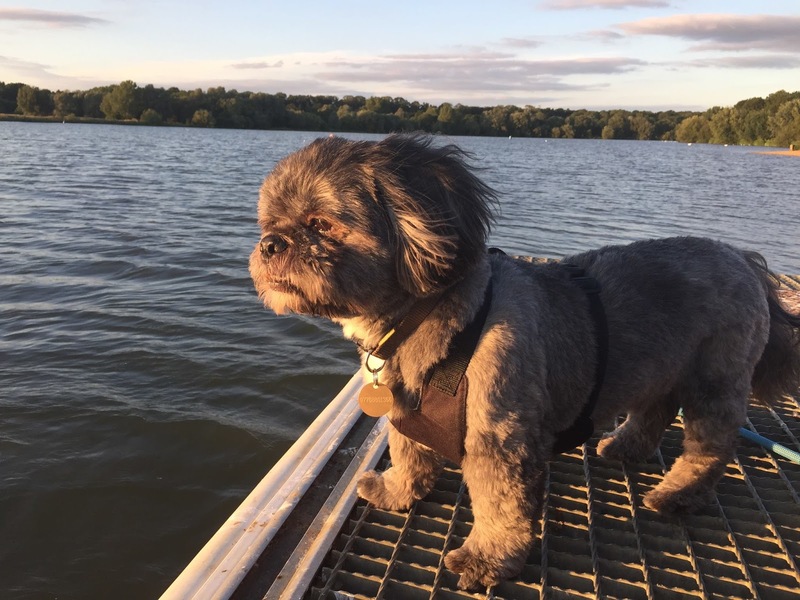 With the help of many dog owners in the local area, I have written an article for the May issue on interesting places to take your dog for a walk within easy reach of Peterborough. The signage to our many beautiful areas, many of which are perfect for dog walking and exercising, is TERRIBLE! Until I did my research, I had no idea there were so many fantastic places to walk Reggie right on my doorstep. I'm sure my article will be a revelation to many dog owners in the area. I do not understand why Peterborough City Council doesn't make more effort to signpost areas of natural beauty more clearly. We live in an area of great natural beauty. Unless you know where to look you're unlikely to find the many gorgeous local beauty spots, most of which are rich in thriving natural habitats and wildlife. The issue containing my article on dog walking will be delivered to addresses across Orton Waterville Ward in the first week of May. If you don't receive Nene Living, but live in Peterborough and would like to see my article, let me know! The Orton Northgate community has yet to be adopted by Peterborough City Council and is still in the hands of the developers. This week, the developers decided to do some work on the path leading to the only playground in the whole development. 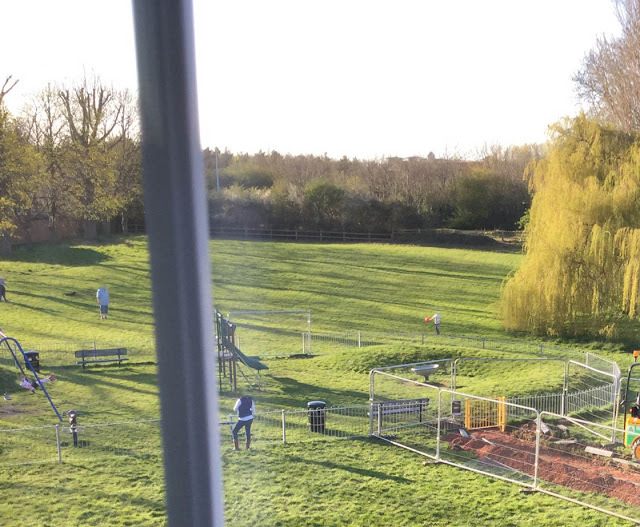 I live near this playground, and have watched this week as bewildered children and their stressed out parents have found to their great disappointment that access to the playground is currently closed. No warning, no information. A thriving community has children happily playing in the fresh air at its heart. Living by the park, I know that summer has arrived when I hear the sound of children's voices, or adults calling their dogs. It's the sound of community, and it's lovely. This evening, after two days of silence while the playground remains inaccessible, I was pleased to hear the sound of children's laughter again. I looked out of my window to see that parents had lifted their kids over the fence into the playground. And quite right too. Public, shared amenities where children and their families can play in the fresh, open air really matter. I'm sad the property developer didn't think to let any of our residents know the park would be closed or how long for, but pleased that families (the ones with parents strong enough to lift their children over the fence, at least!) are not deterred. This didn't need to happen. A community isn't just residents. It includes local businesses, parish councillors and city councillors working together and sharing information. I only know why the park is shut because I went out and spoke to the workmen! What stopped the developer from at least letting the council and/or the Residents' Association know what was going on? The playground has re-opened with new double gates and a new path. Hurrah! What's short, green and makes everyone in the community smile? A Flash Mob Litter Pick! It's short, because it need only take an hour, not the whole day (perfect for a Saturday morning). It's green, because while the City Council is very good at taking away the obvious rubbish, a gang of community litter pickers can focus on the rubbish that's really doing the damage - the stuff that's been lying in the undergrowth for years, suffocating the earth. And it makes the community smile because doing something to make your neighbours feel better makes you feel happy. It's also a great opportunity to make new friends. 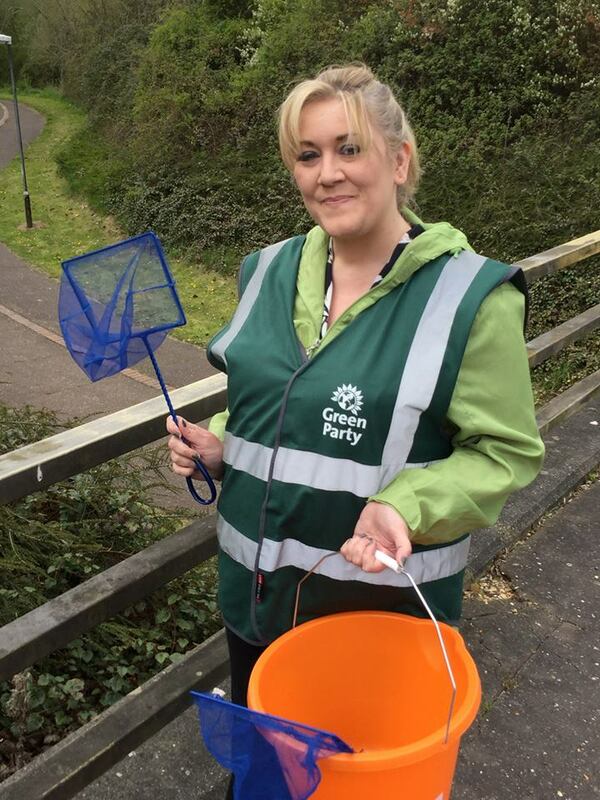 The Green Party does a Flash Mob Litter Pick somewhere in Peterborough every month. Today, however, I and my colleague Alex Airey (who is standing for the Green Party in Orton Longueville) joined in a 'Clean for the Queen' Litter Pick with 20 residents of Orton Southgate. 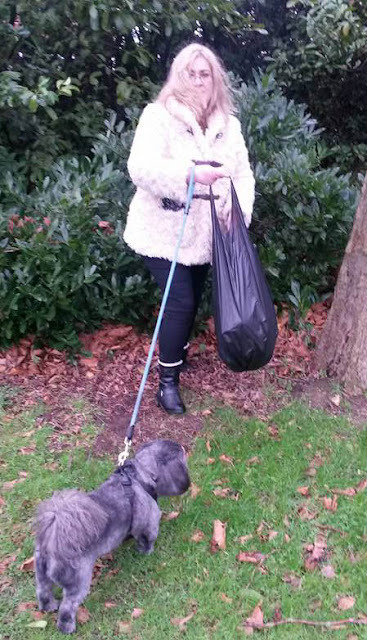 This brilliant event was organised by Orton Southgate resident Vanessa Barton - Alex commented that it was one of the most organised Litter Picks he'd ever attended (and he should know!). We helped Vanessa by providing litter pick sticks and rubbish bags, and Vanessa did everything else, including mapping out which areas we needed to cover, and providing hand wipes and cake and tea at the end. 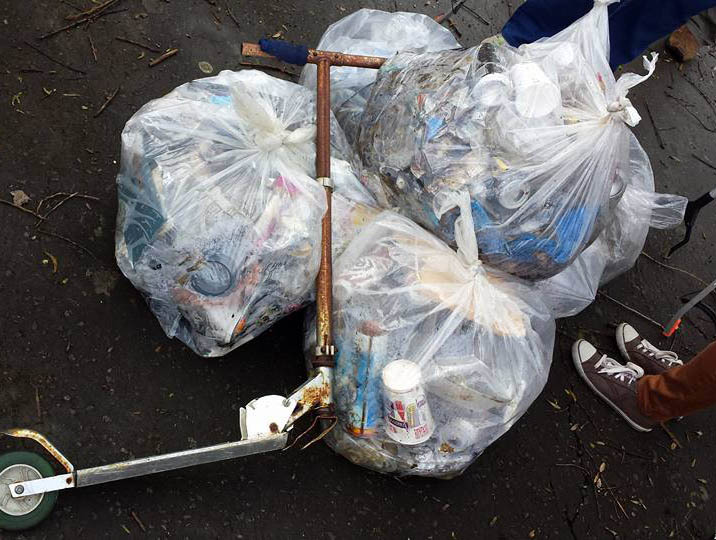 Even though the City Council had cleared litter from the exact same areas the previous day, we collected 20 bags full of rubbish in just one hour. The rubbish we picked was under hedges and in trees and had clearly been there for years, both as an eyesore and suffocating the ground beneath it. Today, Orton Southgate can breathe again! And it was so much fun. We got to know one another a little better and the sense of community was really fantastic. We at the Green Party believe in Zero Litter. From fag butts and chewing gum, to dog and cat poo, to discarded cans, bottles and fast food containers to fly tipping, it's all TERRIBLE. It makes people miserable, it hurts where we live and we want rid of it. ALL of it, not just the stuff you can see from the road! I can't think why anyone would think it's okay to throw these items into the bushes on our streets. Can you? 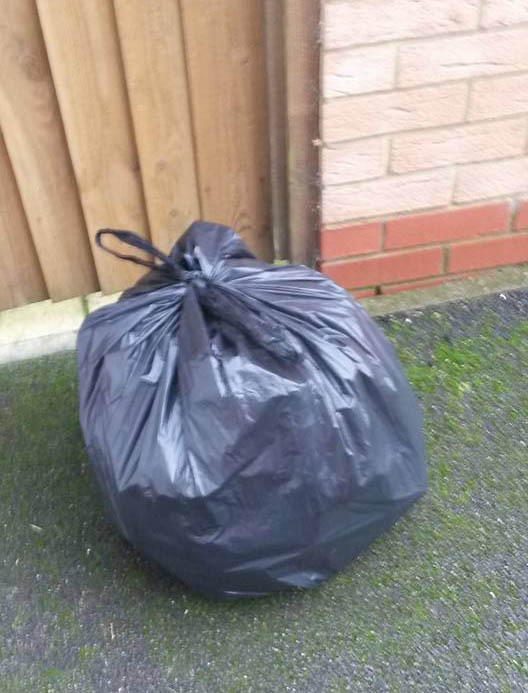 As for the bags of dog poo... please.. put it in a bin (any bin will do)! If you'd like help organising a Litter Pick in Orton Northgate, Orton Wistow, Orton Brimbles or Orton Goldhay, let me know! Peterborough has yet to have a Green Party Councillor. That hasn't stopped us Greens from coming to your streets and asking you about the things that matter to you in your part of our city. I've had the privilege of hearing from many of you (and I hope I'll hear from many more). I've listened and you've told me that these should be my priorities if I'm elected to serve you as a member of Peterborough City Council. There's way too much pavement parking on the streets of Orton Waterville ward and it's making our residential roads dangerous. The pavements are meant for pedestrians, not cars. Cars parked on the pavement are a hazard in particular to blind people (with RNIB in our ward we have a high number of blind and partially sighted neighbours), older people and children. No one should have to step into the road to avoid a poorly parked car. You're also concerned about the speed of traffic, particularly on Dunblane Drive in Orton Southgate, Loch Lomond Way in Orton Northgate, Brimbles Way in Orton Brimbles, Wistow Way in Orton Wistow and Goldhay Way in Orton Goldhay and you would like to see traffic calming measures in these locations. You've also noticed that cars and, in particular, delivery vans, drive too fast down our residential cul-de-sacs. While in other parts of the ward, such as Orton Waterville, heavy goods vehicles have mounted the verge and made a mess of the grass there. 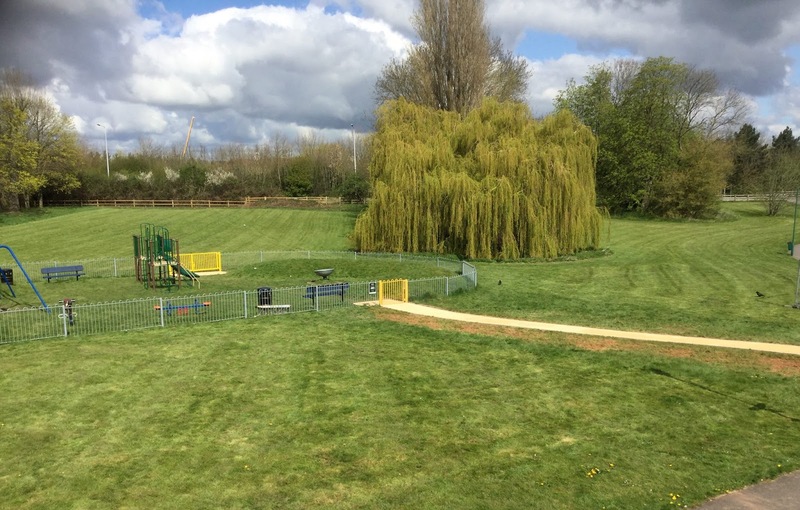 The recent reduction in the number of times the grass is cut by the City Council has had a negative effect on people living right across the ward, including Orton Goldhay, Orton Brimbles and Orton Wistow. Those of you with dogs have been frustrated by the height the grass has grown to at times, making it difficult for your dogs to walk on and harder for them to do their doggy business in comfort! While efforts to create habitats where wildlife can prosper are to be commended, you don't want all grass verges to look unkempt and wild all the time. On the subject of dogs, many of you feel there are insufficient dog bins in the Ortons, those we do have aren't used correctly and there are still too many instances of fouling (even a few thoughtless dog owners bagging the poo then throwing the bag into nearby bushes!). We want to sort this mess out (literally) by making the Council policy on dog poo very clear and providing the resources needed to manage the natural function of dogs that has been allowed to become a menace. General litter is a problem that seems to affect people in all urban areas. The situation in our ward isn't helped by the brisk Peterborough wind or the lack of litter bins. Thankfully, the Council recently replaced the post-mounted bins (that could easily be raided by foxes and crows!) with larger, multi-use floor-standing bins. Everyone seems to agree that these are a vast improvement but you'd like more of them. While crime is pretty low in parts of our ward, whenever a crime is committed (burglary and anti-social behaviour (ASB) in particular) you tell me that you feel more anxious about your personal safety. Anxiety and stress have a detrimental effect on general health, leading to sleeplessness and low mood, which can also affect your relationships at home and your performance at work. At the Green Party, we're keen to support initiatives such as Neighbourhood Watch and Residents' Associations that promote the feeling of community. While not everyone wants to know their neighbours the way they know their family and friends, that feeling of being part of a community and knowing you can turn to someone close by when you want to is really important. For example, people living in Orton Brimbles, Orton Southgate and Orton Goldhay have expressed their frustration about the amount of noise created by the illegal and unregulated 'car meets' that have taken place in the area during the summer months. Those of you who have to be up early for work the next day, have young children or who would simply like to get to sleep at a reasonable hour have said how stressed out you feel when the screeching of tyres can be heard well into the small hours some Saturday nights. It isn't only our younger people who need somewhere to hang out. 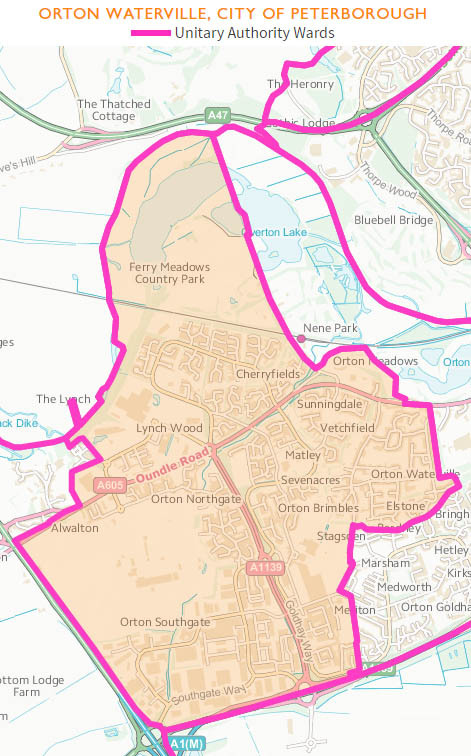 Residents of Orton Northgate and Orton Southgate don't even have a place on their own estates to vote! While the number of houses in these Ortons continues to rise, shared public facilities, such as a multi-purpose community hall, are nowhere to be seen. When you vote on 5th May, Orton Northgate and Orton Southgate residents need to go to Matley in Orton Brimbles to do it. You can get there on foot via the footbridge, but it's a bit of a walk if you live at the far end of either Northgate or Southgate and the last thing we want to encourage is going by car (although you may have little option). A community centre isn't just for voting. It's a place where we can hold community events of all kinds and share information that's of benefit to each other. We are really well served in the Ortons by the 'Orton Sellers & Stuff' and 'OSRA' (Orton Southgate Residents' Association) Facebook pages (the volunteers who run these pages are my personal heroes, and I'm sure many local people feel the same way). But as a community, we need a place to meet. Orton Wistow and Orton Brimbles both have Community Centres. Older parts of Orton, such as Orton Waterville, have a Memorial Hall (memorial halls were established across the country after the First World War). This is a fantastic facility if you live in that area, but we need more like this so everyone across Orton has a place to be within our community. Many of you have told me that you don't see your local councillors enough (and don't see your MP at all!). You are also concerned by the lack of police visibility on our streets and would like more PCSOs and Special Constables in our area. I agree with you. We need more peace-of-mind patrolling and availability, while at the same time the resources to provide these are shrinking. It is becoming more and more obvious that we all have a role to play in bringing our communities together, watching out for each other, caring for those around us. As a Parish Councillor, I already make it my business to be visible and accessible around the Ortons, not just at election time, but all the time. If elected to the City Council I will make myself available to you at times that suit you. In particular, during that crucial 10am-2pm weekday timeframe, when parents of young children are more likely to have time to come and see me. You will also be able to contact me on social media and email and can expect a very fast response from me. Most Councillors have to fit their duties to you around a full-time day job. If elected, I will treat my role as Councillor as my full-time job to maximise my availability to you. My availability to you is of key importance to me and if elected I invite you to hold me to that. "But we told our Councillors about these problems already and they haven't done anything about it!" All Councillors work hard to address the issues you raise. However, your current Council all represent the same political party. On 5th May, you have an opportunity to change this when all three Council seats in your ward become open and candidates from different parties have the opportunity to stand for election. 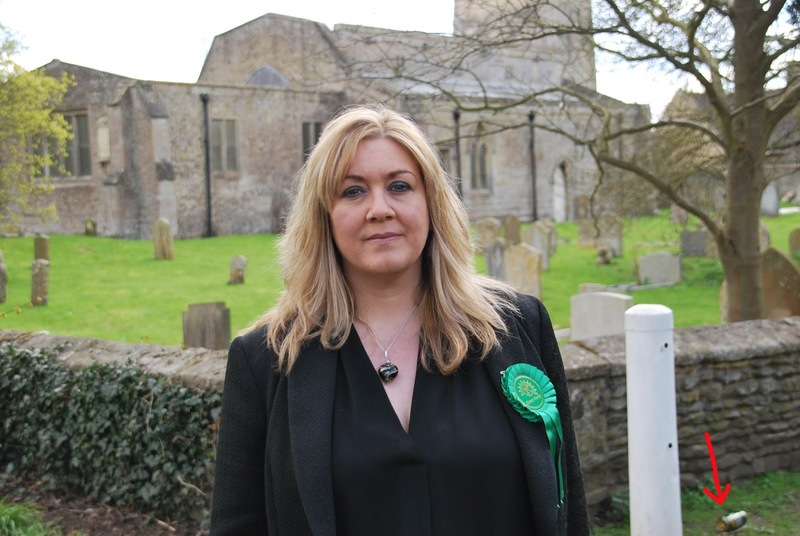 As your Green Party candidate I can provide an alternative voice for you and add much needed pressure and fresh thinking to the current closed shop of councillors from the same party. 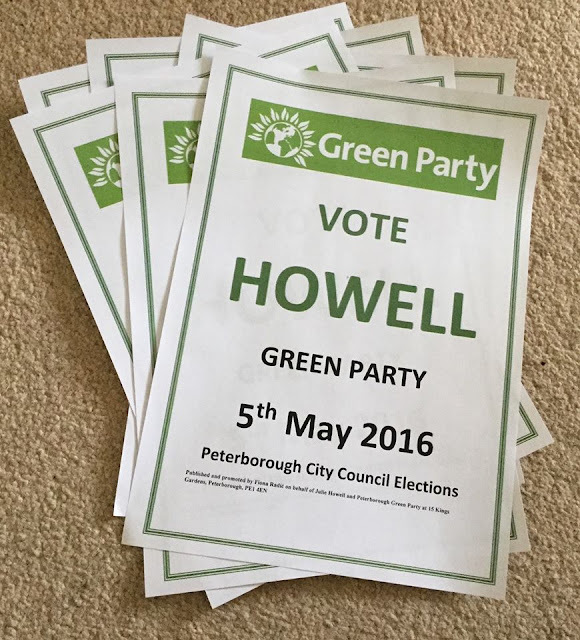 You will have three votes - this means you can still vote for a candidate from your preferred party and also vote for the candidate from the Green Party (which is me, Julie Howell) if you want to. A diverse council gets more done. You may have voted for a particular political party all your life. You know your own mind and you know which flavour of politics most closely matches your views on how the country - and the city - ought to be run. 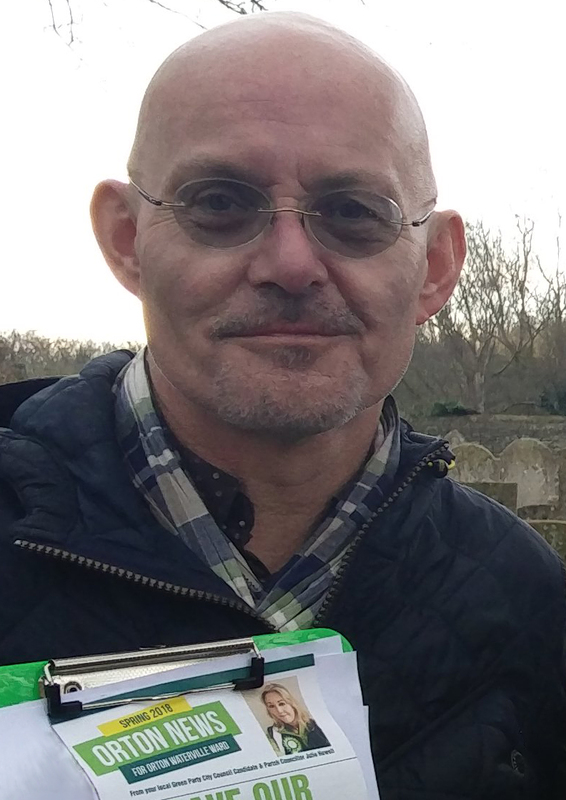 When we're out canvassing and campaigning in Peterborough on behalf of the Green Party we find that most people who have never considered themselves to be 'Green' are a lot Greener than they realise. None of that appeals to me. Then I actually met some Green Party members and realised that I'd been barking up the wrong tree. 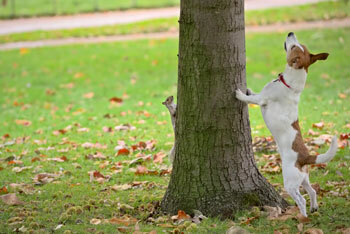 This dog is barking up the wrong tree... are you? Most people's perception of the Green Party is either out-of-date or just wrong. So what do Greens believe? Obviously, we would prefer that you didn't drive the type of car that harms the environment, but we're far more interested in how you drive on the residential streets in our city. Our 'Twenty's Plenty' campaign asks drivers to go at 20mph in residential areas, those places where children and older people live, and where domestic cats and resident wildlife wander freely. This idea is right up my street. I have noticed that visitors to our housing estates and residential streets - particularly delivery drivers who are driving to a deadline - travel way too fast. Is there really any need to do much more than 20mph in a cul-de-sac? I want to be safe in the place where I live and I want my neighbours and loved ones to be safe too. If I do get hit by a speeding car, or become ill or injured for any other reason, I want to be able to do what I've been able to do my entire life: turn to a public National Health Service for care and treatment. I don't want a return to pre-NHS times, when people who couldn't afford healthcare died or became disabled by treatable conditions simply because they didn't have the means to pay. Over the years, I have received outstanding care from the NHS in Peterborough, just when I needed it. The Green Party believes in a strong, joined-up, publicly-owned and publicly-accountable NHS for everyone. 3. Industrial pollution? Fly tipping? Littering? Irresponsible household waste management? No thanks. Orton Waterville ward is an area of incredible beauty. Take a walk around Ferry Meadows or along the River Nene and you can't argue with the simple fact that we live in a very special place. However, our river and our environment are under constant threat from industrial polluters and pollutants and new industrial initiatives that while good for the local economy are not always so good for local residents. If I wanted to live in a concrete jungle I'd move back to London. I don't. I want to live here surrounded by natural beauty. It isn't just industrial waste we should be concerned about. Sadly, not everyone who resides in or visits our beautiful areas understands how destructive littering and fly tipping truly are. This type of waste harms wildlife, and the sight of it is simply depressing. Yes, the Government can and should do more to protect our natural heritage, but we can all do something to keep our part of Peterborough beautiful. Next time you fancy a walk, take a pair of protective gloves and a bin bag with you and pick up any easily accessible litter that catches your eye. Sadly, you'll be amazed how quickly your bag fills up. Happily you'll be doing something extremely positive about it. I don't have a very big family, so there is no big family dinner to be cooked on Christmas Day. This year, I decided that I would do something for my community instead of stuffing my face, and went litter picking in my local area with my little grey helper (if you include the photographer, my two little grey helpers!!). Clearing some unwanted Christmas gifts away! In just 20 minutes, I picked up this much rubbish from a cycle path between Lynch Wood and Oundle Road. Most of it was discarded food packaging (the notorious Peterborough wind blows it into hedgerows where it stays and does a lot of damage to the natural habitat). I've since learned that the Peterborough Green Party regularly holds 'Flash Litter Picks' all over the city, where local people give up an hour or two of their time to clear litter from their local area. We know it's the City Council's responsibility to clear the waste from our streets, and we also know we didn't drop the litter! But as good neighbours we're all happy to pitch in and do our bit. As for household waste, having lived in other counties where the city councils don't get it quite right, I can very confidently say that Peterborough does a superb job of enabling householders to dispose of our waste in a way that is very good for our environment. Like most people who grew up in the 1970s or before, I was used to dustbin men (they were always men) picking up anything you left by the back gate (really, there was nothing they wouldn't take!). I never gave a thought to where that rubbish went, and it pains me now to think of all that stuff in a landfill site. Now, we live in brighter times and much of our household waste can be recycled. But we shouldn't take these initiatives for granted. They cost money to run and at times when public services are being squeezed we must ensure the vital initiatives paid for by the taxpayer - like keeping our streets and other areas clean - are protected. Green initiatives like these mean we're all already involved in keeping our environment beautiful, don't you agree? You see, you are Green, you just didn't know it. RED ALERT: The green initiatives we have today may not stay in place forever without constant pressure from councillors who pledge to keep the needs of our communities and our environment in the spotlight. Peterborough needs Green Party councillors. Right now, in 2016, we have none at all. 5th May is your opportunity to change this for the better. 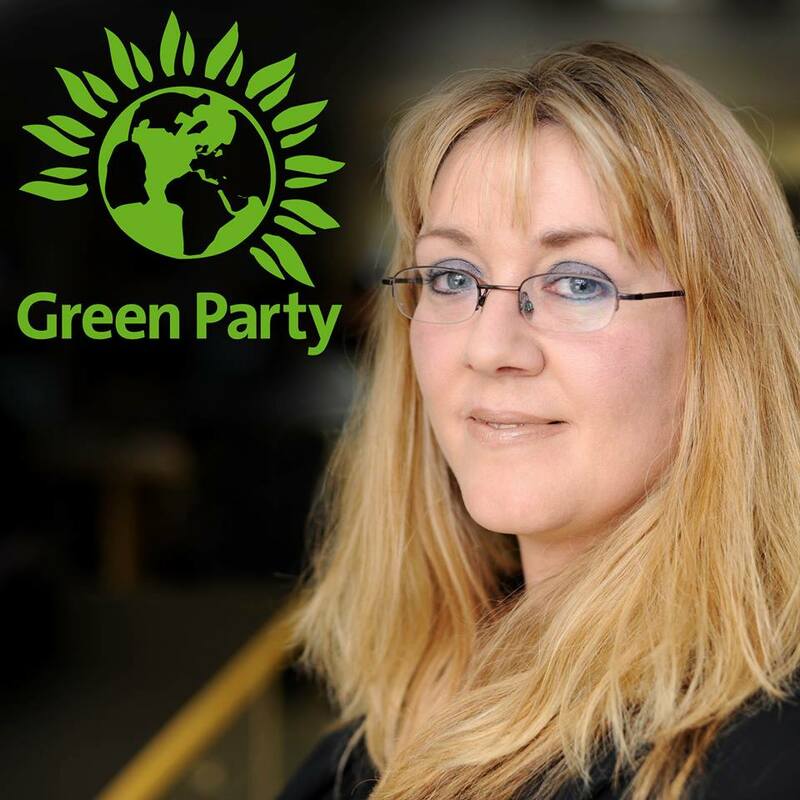 Please vote for your Green Party candidate in the Peterborough City Council elections (that's me - Julie Howell - if you're in Orton Waterville ward). The Green Party isn't here to tell you what to eat or what car to drive, where to buy your clothes or to make major and unrealistic changes to the lifestyle you enjoy. We are not attempting to be the majority voice in local Government, but we do feel that it is vital that we are inside the council, being the voice for our people and our planet and ensuring what we enjoy today is protected for tomorrow. Some of us get to be born more that once in our lifetime. The first time for me was in 1971, when my mother gave birth to me in a hospital in Andover. The second time was in 1991, in a GPs' surgery in Brighton, then another in Camberley, then in a hospital in Frimley, then another in Surrey. The second birth was a little more tricky than the first (though my mother might argue otherwise), because it involved the complex and time-consuming process of diagnosing my MS. So I've had two successful births, and endless loving care before, during and after each one, all of it on the public NHS. Getting my MS diagnosed when I did changed everything in my life for the better. If I hadn't been able to turn to the NHS for help when I was at my most vulnerable, at the start of life with a condition that would affect every important decision I have made as an adult (and every important decision the rest of the world would make about me) I really don't know what would have become of me. I owe the NHS everything. Today, junior doctors all over the country are on strike over the imposition by the Conservative Government of contracts which the junior doctors describe as "unsafe and unfair". I, and the Green Party, wholeheartedly support the striking junior doctors in their efforts. We condemn the disgraceful treatment the Conservative Government is meting out to those young men and women who have devoted their lives to giving millions of people who rely on the NHS the most precious gift of all: our quality of life. I smiled when I heard that cast members of the Channel 4 comedy Green Wing had turned out to support the striking junior doctors at Northwick Park Hospital earlier this week. I have received treatment at Northwick Park that probably saved my life on not one but two occasions when I lived in nearby Harrow. To the junior doctors who have been placed in this appalling position I send my loving support. Long live the public NHS. I've always taken an interest in politics. Over the past 40+ years I've sat through more tedious party election broadcasts than a reasonable person should. So what a joy this is. Not only is this the most engaging, insightful, on point and shareable party election broadcast I've ever seen, it's made by the Green Party!! Of course, there is a grown up message behind it all. On Thursday 5th May, you have the opportunity to vote for change in your local community. Orton Waterville has never had a Green Party Councillor. At present, all three of our City Councillors are from the same political party (Conservative). Have your Councillors consistently delivered the change you hoped to see in Orton Waterville. Have they worked hard to preserve what is important and beautiful about our surroundings as our city continues to grow? Or is it time to switch things up and introduce fresh faces and fresh thinking to Peterborough Town Hall? A Green Councillor will bring 'Grown Up Politics' to Orton Waterville. If you agree that it's time for a positive change, vote for your Green Party candidate on 5th May. I'm ready if you are, no kidding around. On Thursday 5th May 2016, I will stand for election in Orton Waterville ward in the Peterborough City Council Elections. When you go to your polling station to vote, you will see my name JULIE HOWELL on the ballot paper along with the names of other candidates. I am standing on behalf of the Green Party. The Orton Waterville ward includes Orton Southgate, Orton Northgate (I live here), Orton Brimbles, Orton Wistow, Orton Waterville and parts of Orton Goldhay. As a resident of this ward, I enjoy the many benefits of having good neighbours and of being a good neighbour, of being part of a thriving community and helping to build this community. Standing for election to the City Council is a massive step up from simply being a good neighbour. To be an effective City Councillor is to put the needs of the people who live in our community first and requires many 'people skills', including listening, understanding, speaking up and not giving up at the first hurdle! Orton Waterville has never had a Green Party councillor. You may be wondering why I have decided to stand for election to the City Council and, in particular, why I have decided to stand on behalf of the Green Party. Orton Waterville is a lovely place to live. Outstanding natural beauty and a vibrant, diverse community that deserves the support of a committed City Council, with councillors who really listen and really engage (all year round, not just when there's an election coming up!). We're very fortunate in Peterborough. We are less than an hour by train from London, yet we are not London. We don't have to pay London prices to live here and more of what we do earn we can re-invest in our local community by spending with local shops and businesses. While some of us do commute to London for our jobs, increasing numbers work right here in our city, with many now working from home. And why not? With our mix of the very best in public venues, business parks, and super-fast broadband set in or close to acre upon acre of unspoilt countryside this is a wonderful place to live. Most days I walk around our neighbourhood and think to myself, "This is a beautiful place." I want Orton Waterville to continue to be a beautiful, safe, community-oriented ward even as the region continues to develop and grow. We must protect our rich, natural environment, ensure what we take from nature we also put back, and continue to build strong communities so that no part of our area becomes just another 'dormitory town' for people who can't afford to live in London. I know my neighbours. I know where to turn if I need help in my community. I want everyone who lives in Orton Waterville to feel the same way. I have a lot to say about why Orton Waterville needs - and deserves - to have its first Green City Councillor. Look out for future posts and do please share your thoughts with me and other readers. I'm attracted to the Green Party for many reasons. The greatest of these is the Party's position on the rights of older and disabled people. As I've already shared with you, I've had MS for more than a quarter of a century, and most of my adult life has been dedicated to serving the needs of disabled people. 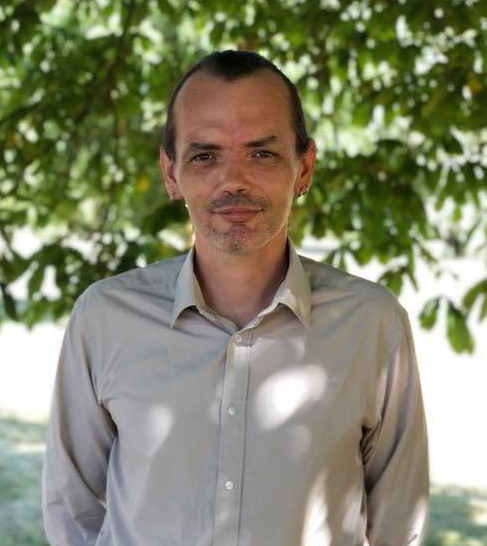 I am unwavering in my belief that disabled people, Deaf people, people with conditions that affect their mental health, people with learning disabilities, people with living with cognitive impairments, older people, people who are temporarily disabled due to illness or accident and people living with long term conditions have the fundamental right to participate in society as fully as everyone else. Disability can be expensive. It can be lonely. It can be confusing. It can be isolating. But with the right social policies disability doesn't have to be any of these things. Disabled and older people can be - and want to be - valuable, active and motivated members of our community. I will be the first to say how access to the internet has changed disabled people's lives for the better. Suddenly, we are on a level field where we can participate in community conversations and can make our views heard. But life still happens in the 'real' world and that's why it's vital that disabled people are able to move about in our community safely and easily, to have 'real life' friends as well as friends online and to participate in the real life activities that everyone else enjoys. The Green Party has a lot to say on the subject of disabled people's rights. If elected to the City Council, you can be sure that I will put the needs of Orton Waterville's older and disabled people at the heart of everything I do. A City Council made up of Councillors from different political parties is likely to work harder and achieve more than a City Council where all Councillors represent the same political party. 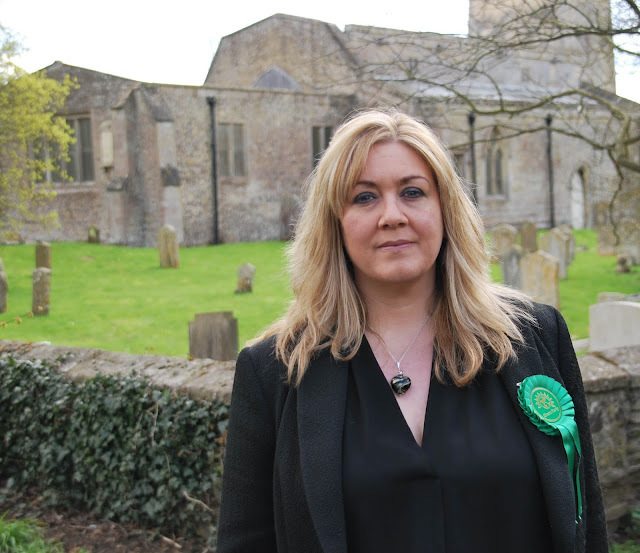 Past elections have show that growing numbers of people in Orton Waterville are choosing to vote for the Green Party candidate, which is why I'm really pleased to put my name on the ballot paper as a representative of the Green Party. As I'm sure you agree, people who want to vote Green should be able to do so. I have also decided to stand in this election for a deeply personal reason. In October of 2015, a dear friend and noble campaigner for democracy and citizen engagement suddenly passed away at the age of 47. His name was Dan Jellinek. I'd known Dan for around 15 years, having met during my time as a disability rights campaigner for RNIB. He is the author of 'People Power: a user's guide to democracy'. When considering whether to stand for this election I asked myself, "What would Dan say?" Without a doubt he would have given me his full support and encouragement. So it is also in loving memory of my dear friend Dan that I stand for election to Peterborough City Council. A wise person (possibly Gandhi!) encouraged us to 'be the change you wish to see in the world'. But what do these words mean to the people of Orton Waterville? Well, for this resident, they mean being a good neighbour. In our super-fast lives we can spend so much of our time focusing our attention and energy on 'things' (mobile phones and tablets in particular!) that we forget the very basic but very important 'skill' of being a good neighbour. If you have lived for a long time in one of the more established parts of Orton Waterville, then you may already know your neighbours very well. You may know, without a shadow of doubt, that you can turn to your neighbours in a time of need and be committed to being there for any neighbour who may need your help. However, not everyone knows their neighbours or feels that they live in a community. For some, family life leaves little time to get to know the people in their street. For others, uncertainty and simple shyness can be real barriers to making new friends. Some people commute to work and don't spend as much time in their homes in Orton Waterville as they would like to, but still want to feel that they 'belong' in our community. I recently watched a BBC documentary about loneliness and was struck by the revelation that it isn't only older people who can experience the feeling of being alone. It is possible to be surrounded by people but feel no real connection to them, and this is a situation I would like to see change. I am desperately keen that everyone in Orton Waterville feels that they belong to a 'neighbourhood' IF they want to. There are many big things we can do to encourage the spirit of neighbourliness in Orton Waterville, from forming Neighbourhood Watch Schemes and Residents' Associations, to making an effort to introduce ourselves to neighbours we haven't spoken to before. But there are also tiny acts of neighbourliness that we can take part in every day, that don't cost money or time. For example, sometimes I set myself the challenge of saying hello to as many people as I can while taking my dog for a walk. While that sounds like a really small thing (and for me it is) when you say 'hello' to someone you may be the only other person they've spoken to that day. Just a simple smile and hello can really boost another person's mood (and if they don't return it, that's okay too!). Five of the reasons why I'm standing as a Green Party candidate for Orton Waterville in the Peterborough City Council elections on Thursday 5th May 2016. I am committed to serving every resident of Orton Waterville to the very best of my ability, listening to what you tell me is important and representing your needs. Do please get in touch with me and let me know what matters to you. I'm all ears. Thank you for coming to find out more about me. My name is Julie Howell. I'm 45 years old and I live in the beautiful and vibrant city of Peterborough in Cambridgeshire, UK with my partner David, our two cats Derek & Gracie and our dog, Reggie. I first moved to Peterborough in 2003, and lived in Woodston for a number of years. I now live in one of Peterborough's newer areas: Orton Northgate. If you are familiar with the region then you will know about the fantastic Peterborough Arena which is situated on the legendary Peterborough Showground. Orton Northgate is immediately adjacent to the Showground in the ward of Orton Waterville. I have a lot of love for Peterborough, our wonderful people and our beautiful surroundings. I have been a Parish Councillor for Orton Waterville since May 2015. On 5th May 2016, I will stand again for Orton Waterville Parish Council, as an independent Parish Councillor. On this day, I will also stand in the Peterborough City Council elections as the official Green Party candidate for Orton Waterville ward. I have had a varied career to date. My degree is in Library & Information Studies (University of Brighton, 1989-1992). Although my passion for access to reading and information never dwindled, in 1997 I moved out of libraries and into the world of the Web, when I became responsible for the website at the Royal National Institute of Blind People (RNIB). In 1999, I became RNIB's campaigns manager for digital issues. It was my responsibility to make businesses and the Government aware of the need to design their online systems to ensure that disabled people can use them. An online system can be on a computer or another web-enabled device, such as a mobile phone, touchscreen, cash machine or television. I love RNIB. During my time there I worked on the first British Standard specification for website design and I travelled the UK (and visited other countries such as China, USA, United Arab Emirates, Canada and the Netherlands) to spread the important message of accessible technology for all. I moved on from RNIB in 2006 to work in the web design industry and from 2010 I have run my own business, coaching people in confidence skills (my first book on the subject was published in 2014). I have been an active disability rights campaigner for many years. In 1991, when I was aged 20 and still at University, I was diagnosed with the neurological condition multiple sclerosis (MS). I have been living with MS for more than a quarter of a century now! Although it is a nuisance at times, MS has gifted me with the opportunity to see life through the eyes of people living with chronic conditions and disability and I remain very concerned that we should all enjoy the the best quality of life possible, regardless of disability or circumstance. In 1995, I founded one of the world's first online communities for people living with MS. It's called Jooly's Joint, and has around 60,000 members from all around the world. I wholeheartedly support the Green Party Philosophy on Disability. Although I do get homesick when away from Peterborough for any length of time (it's true!) I pop down to Brighton a couple of times a year. Not only is Brighton home to Caroline Lucas, the first British Green MP (Brighton Pavilion), it holds a very special place in my heart as I was once a student of Brighton University. In 2012, I was incredibly fortunate to be chosen from 15,000 former students as the winner of the University's inaugural Alumnus of the Year award. When receiving the award, I was asked to give a short 'inspirational' speech to 2000 graduating students at the prestigious Brighton Dome. The eagle-eyed among you may have spotted one of my greatest musical heroes, singer-songwriter Nick Cave in the video! 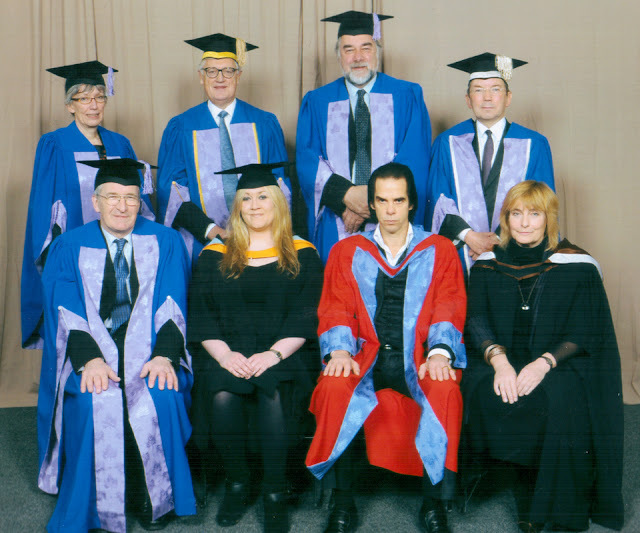 Nick received an honorary degree at the same ceremony, which meant I had to suffer the excruciating embarrassment of giving a speech in front of my idol! The photo of us in our graduation robes is one I'll always treasure. You can already guess that I also love animals. My two cats and dog are all rescues, adopted from the wonderful Wood Green, The Animals Charity in nearby Godmanchester. Animals do a great deal to enhance our quality of life and pets can be a wonderful source of joy and companionship. Later this year, I'm doing a Firewalk to raise money and awareness for Wood Green. I'm also currently writing a blog about my Wood Green cat Gracie, who is now doing really well after a very difficult start in life. In my spare time I like to walk Reggie in our beautiful countryside, work on my family tree, and catch up with friends over a glass of wine. I also make a nice chocolate cake (I'm not a very good cook, but I try, and nearly everyone loves chocolate!). I joined the Green Party because I support what the Green Party stands for and over the next few posts I'll tell you exactly what inspires me about being Green and why I believe Orton Waterville needs a Green Party Councillor. I want the very best for all Orton Waterville residents from every walk of life. We are a very diverse ward, and that's one of the many reasons why Orton Waterville is such a great place to live. That's enough about me for now! I welcome your comments and questions and look forward to meeting more of you in the weeks leading up to polling day on Thursday 5th May 2016.